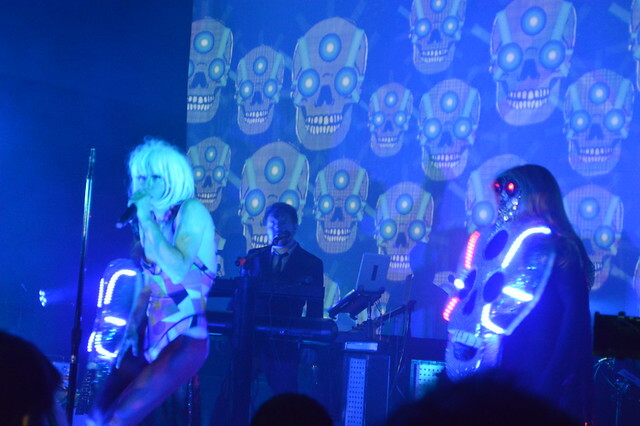 As previously, video projections on to the screen at the back of the stage appear as if a great aquarium of color had been placed behind the band. Four players occupy the corners of the stage — drums and keys at the back, guitars/keys/percussion forward left, and bass/keys forward right. A large space is set aside in the middle of the stage to allow for the aforementioned spectacle. 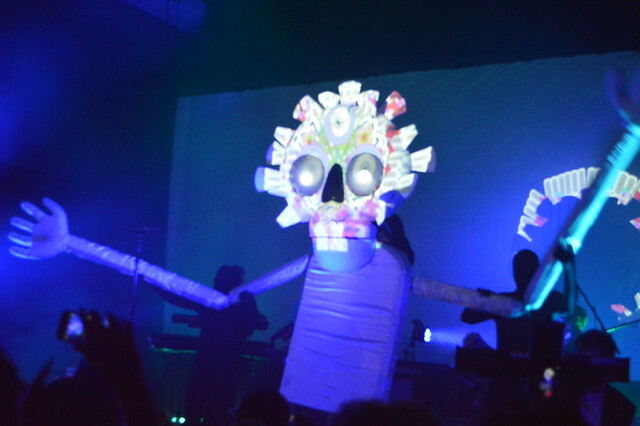 Throughout the show, a troupe of costumed apparitions will amble out on to the stage like mummenschanz puppets from the playset of the id, both whimsical and creepy. The first to appear is a bleached marshmallow skull with glowing eyes and enormous arms. It lazily beckons us into its lair and introduces us to our host. 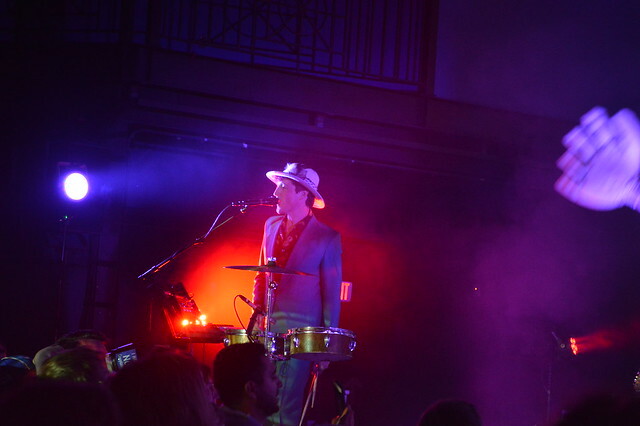 Vaulting onto the stage is the band’s central member and creative force — Kevin Barnes. 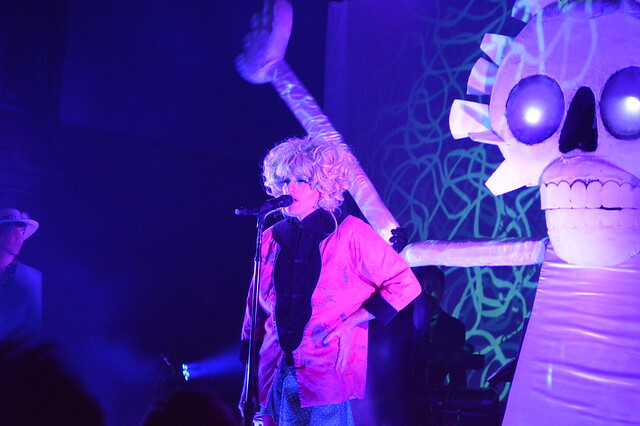 He appears at first as a garish cross between Hedwig and Patsy Stone, with heavily painted features and an enormous blonde Dolly Parton wig. His energy is frenetic as he launches into “Gronlandic Edit” from 2007’s Hissing Fauna. The set moves quickly through “Paranoic Intervals” from their latest release White Is Relic/Irrealis Mood and on to “Plastis Wafer” from 2008’s Skeletal Lamping. The pacing of the performance reminds me of a James Brown revue, moving quickly from song to song with immediate segues and only occasional breaks. I don’t feel too bad having described their sound as “indie disco” to my companion, as the slick rhythms and slinky guitars of the first third of the set evoke the feeling of a Lincoln convertible parked outside the Danceteria. But as the subsequent movements of the performance reveal, the band is much more complex and varied than that. There is a retreat from the dance rhythms to a slower more experimental pace. This is accompanied by Kevin’s many visual transformations. I could offer obvious comparisons to Bowie’s shifting personas, but suffice to say I appreciated Kevin’s nod to glam. If you ever found the notion of bands performing in their sweats and street clothes a tad tedious, then you can relate. The cast of costumed compatriots changes as well, from dragons to robots to nymphs and so on. 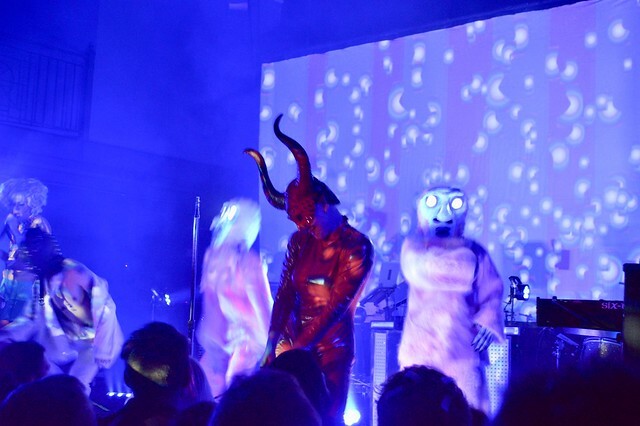 None would be out of place on a stage with The Residents. The set is brought to vigorous crescendo with the airy splendor of “A Sentence of Sorts in Kongsvinger.” As the band exits the stage, three of the costumed dance troupe remain. 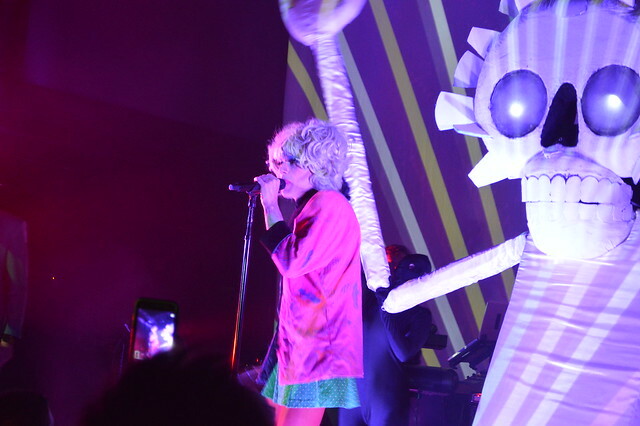 They proceed to build up anticipation for the encores, which include “Gallery Piece” and “Let’s Relate.” Kevin returns to stage in a loose pajama top, and this is quickly discarded to reveal a lithe form reminiscent of Stooges-era Iggy Pop. He makes a good case for a return to flashy glam rock. 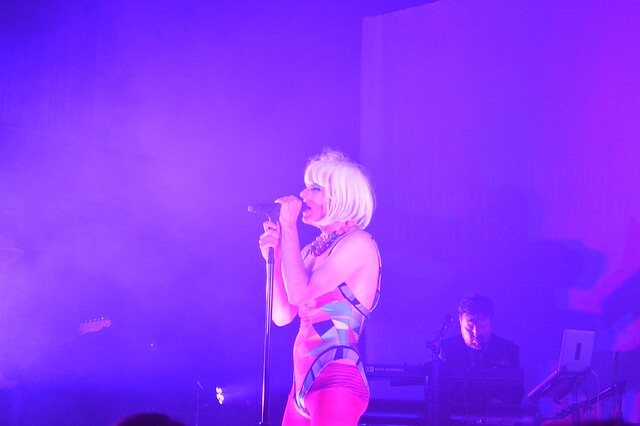 Here are a few more pictures of Of Montreal performing at 9:30 Club on March 25, 2018. All photos copyright and courtesy of Neal Keller.